Iodine is an element that is needed for the production of thyroid hormone. The body does not make iodine, so it is an essential part of your diet. If you do not have enough iodine in your body, you cannot make enough thyroid hormone. Thus, iodine deficiency can lead to enlargement of the thyroid (goiter), primary hypothyroidism and to mental retardation in infants and children whose mothers were iodine deficient during pregnancy. 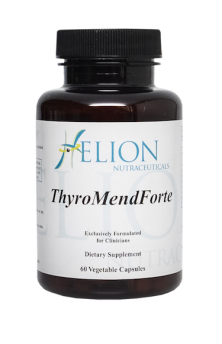 ThyroMendForte™ is an exciting, multi-faceted formula featuring targeted nutrients that promote healthy thyroid function. Many aspects of health, including body composition, energy level, and cognitive function are impacted by thyroid hormone activity. 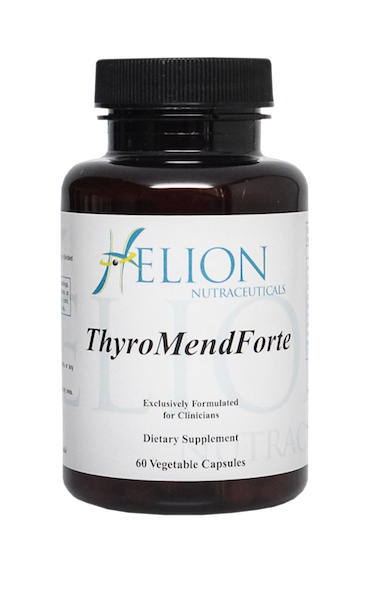 ThyroMendForte™ provides material components for healthy synthesis of thyroid hormones, supports the conversion of thyroxine (T4) to the more bioactive triiodothyronine (T3), may enhance the binding of Thyroid hormones to receptors to DNA, thereby supporting the expression of thyroid hormone-responsive genes.